There has been a lot of talk lately in the news about chocolate actually being good for you! Yay!! My summary of everything I've read is that chocolate is good for you in moderation because it contains flavonoids and antioxidants, which many people believe are "health-promoting" for our hearts. This doesn't mean you should reach for the first candy bar you see, but it does mean you can work some chocolate into your diet or healthy lifestyle. A few years ago, I discovered these amazing chocolate wedges called "The Chocolate Traveler" at my local Trader Joes (with amazing nutritional info). These one-serving sized chocolate wedges are a gift to those of us who love chocolate, but strive to eat it in moderation. Each wedge is a bit over 30 calories (1 WW point), and is big enough to satisfy your chocolate or sweet craving. I have a deal with myself where I only eat one a day, but I get to eat one every day. 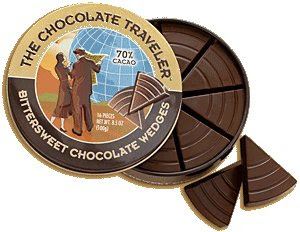 I believe they come in both dark and milk chocolate (I prefer dark chocolate -- I think it tastes better, and it supposedly better for you), and the tin contains two layers of wedges. As I mentioned above, these tins are available at Trader Joes, as well as at the Yummy Diet Food Amazon Store. I know you will love them, but let me know what you think! Also, has anyone found them anywhere other than Trader Joes? I've had this chocolate and it is delicious! easy to eat just one or two wedges and put the rest away. These are so good! I am able to eat one at a time and just take small bites to make the flavor last. They're great when I need a tiny boost in the late afternoon, and they're only like 30 calories each! I normally do not like dark chocolate. Milk chocolate is my first choice. But since becoming a diabetic, I have to limit if not eliminate all sugar. Impossible for me, so I purchased Trader Joe's dark chocolate wedges and ate only 1 wedge every couple of days. They are wonderful, tasty and satisfying. I am happy I discovered them.